As you probably all know, the Square Mile of the City of London is the world's second biggest financial centre, and ever since the mid 80s has very much followed suit in the Thatcher Reagan concoction of deregulated markets, fluid global finance, strange derivatives, and the sharp increase in wealth inequality that comes from the 'Anglo Saxon Model'. Indeed, the problems of the last three years are very much an international problem, with a transatlantic origin. 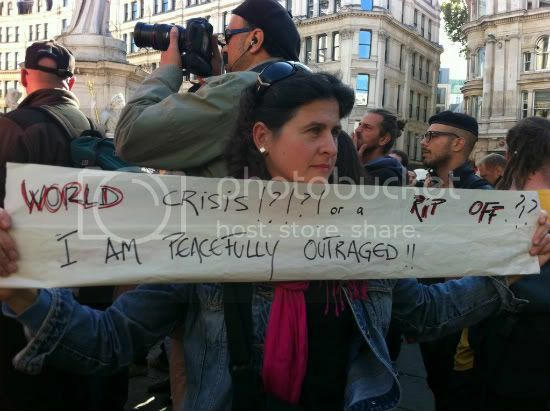 So it's about time the Occupy London movement took root. 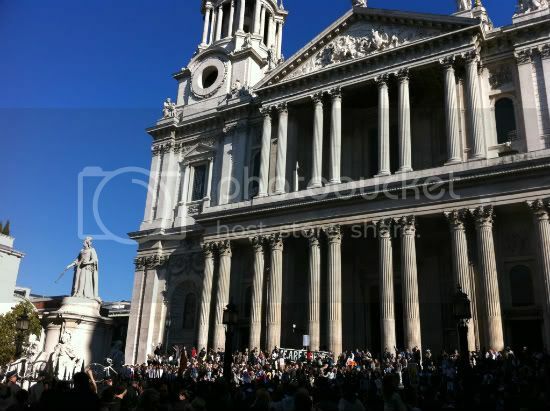 I live on the edge of the City, only a ten minute walk from St Paul's where the demonstrations began at Noon today, so it hardly showed great radical commitment to head down there, be a witness and a supporter, before heading back to diary what I saw. I would have stayed, but my daughter is not well, and I didn't want to get 'kettled' (contained) by the police, and unable to look after her this evening.